Trump Slams NFL And Jemele Hill Following ESPN Suspension : The Two-Way The network said the host of SportsCenter violated social media guidelines when she weighed in on the controversy around NFL players kneeling during the national anthem. 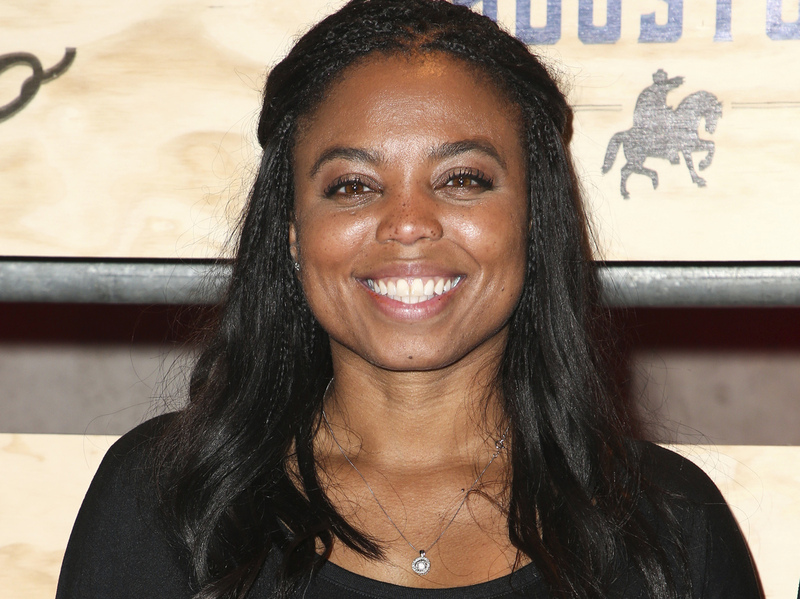 ESPN suspended sportscaster Jemele Hill on Monday for a violation of the network's social media guidelines. Sports, politics and perceptions of patriotism collided once again when President Trump tweeted early Tuesday about ESPN's SportsCenter host Jemele Hill, suggesting she is the reason for the network's poor ratings. Hill was suspended a day earlier for comments about the ongoing national anthem protests. Trump also went after what the NFL pays in taxes, tweeting, "Why is the NFL getting massive tax breaks while at the same time disrespecting our Anthem, Flag and Country? Change tax law!" ESPN suspended Hill on Monday "for a second violation of our social media guidelines," the network said in a statement. The first violation came last month, when Hill tweeted that Trump "is a white supremacist who has largely surrounded himself w/ other white supremacists." At the time, ESPN said it had addressed the comments with Hill and "she recognizes her actions were inappropriate." Hill, a prolific tweeter, avoided an outright apology but said she regretted having "painted ESPN in an unfair light." Press secretary Sarah Huckabee Sanders said Hill should have been fired for the "outrageous comments." In the second violation, Hill said Sunday night that fans who "feel strongly" should boycott advertisers of Dallas Cowboys owner Jerry Jones, after he seemed to come out against players protesting during the national anthem. Earlier Sunday Jones told The Dallas Morning News, "if there is anything that is disrespectful to the flag then we will not play." Jones made the remarks after the Cowboys lost to the Green Bay Packers 35-31. "You understand? If we are disrespecting the flag then we won't play. Period." The comments put Jones at odds with the players union as well as NFL Commissioner Roger Goodell. It was an apparent turnaround for Jones, who just two weeks earlier had himself knelt and linked arms with players at a game against the Cardinals in Arizona before rising as singer Jordin Sparks began the national anthem. Jones said after the game that it was a statement about "unity" and "equality." Just before her suspension was announced, Hill tried to clarify her statement about Jones, tweeting, "I'm not advocating a NFL boycott. But an unfair burden has been put on players in Dallas & Miami w/ anthem directives." The Dallas Cowboys, led by owner Jerry Jones, take a knee prior to the national anthem at a game against the Arizona Cardinals on Sept. 25 in Glendale, Ariz.
Dolphins owner Stephen Ross also spoke out against players who kneel, saying Sunday, "I think it's incumbent upon the players today, because of how the public is looking at it, is to stand and salute the flag." But even as Hill denied advocating an NFL boycott, Trump himself has supported one, tweeting last month, "If NFL fans refuse to go to games until players stop disrespecting our Flag & Country, you will see change take place fast. Fire or suspend!" Days earlier, Trump delivered a fiery speech at an Alabama rally, when he used an expletive against players who kneel. 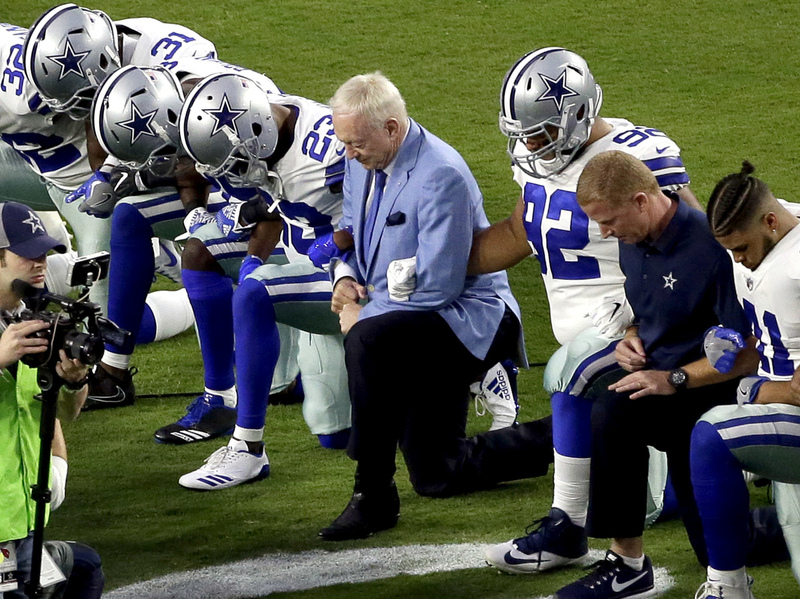 His remarks prompted a rare display of unity among owners and dozens of players, who demonstrated in some way around the national anthem, including Jones. Vice President Pence made his own statement when he walked out of Sunday's game after several San Francisco 49ers took a knee. "I left today's Colts game because President Trump and I will not dignify any event that disrespects our soldiers, our Flag, or our National Anthem," Pence, a former governor of Indiana, said in a statement about the seemingly orchestrated display. Then-San Francisco 49ers quarterback Colin Kaepernick launched the form of silent protest last year. "I am not going to stand up to show pride in a flag for a country that oppresses black people and people of color," he told NFL Media at the time. "To me, this is bigger than football and it would be selfish on my part to look the other way. There are bodies in the street and people getting paid leave and getting away with murder." The now-free agent remains unsigned by a team. Many players continue to kneel, sit, link arms or raise a fist as "The Star-Spangled Banner" plays. As some fans boo and others cheer the displays, which have come to encompass political statements in addition to symbolizing social injustice, the movement Kaepernick sparked shows no sign of letting up.